In the geothermal area of our business we proudly represent the complete line of GeoComfort geothermal systems throughout south central Wisconsin including the greater Madison, Wisconsin area. 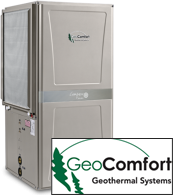 We offer GeoComfort geothermal systems that meet the varied geothermal situations with the appropriate geothermal solution, whether that is in a packaged geothermal system, combination geothermal system, water to water geothermal system, and/or split geothermal systems with natural gas. We provide geothermal systems for new construction as well as retrofit the correct geothermal system to remodeled homes throughout south central Wisconsin. We provide systems that allow for all geothermal benefit options including in floor radiant heat, water heating, humidifiers, air cleaners, energy recovery and heat recovery ventilation, UV lamps, and we can design geothermal systems that merge with your current heating and ducting systems.